Ohio TeleCom will Install, Service and Repair Nortel Norstar 7208 Meridian Business Telephone Systems in Dayton, Columbus, Cincinnati Metro Areas. shows the time, date, call information, and guides you. appear beside lines and features. starts or ends a feature. 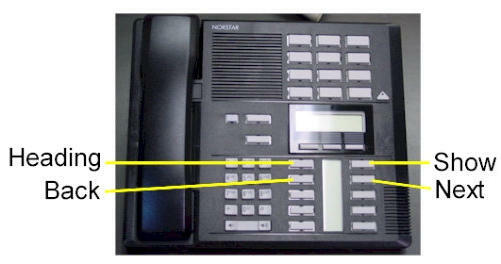 Press the button beside the flashing º before lifting the handset. have to lift the handset before making a call. 1. If you do not have an external Prime line, press a line button. 2. 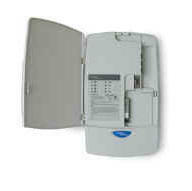 If º appears beside an Intercom button, enter a line pool access code. Press an Intercom button without º, then enter a line pool access code. 3. When you hear external dial tone, dial your call. 1. If you do not have an internal Prime line, press ∆. 1. Press © instead of lifting the handset. 1. Press ˙. The º flashes beside the line on hold. 2. Press the line button with the flashing º to return to the call. Remember: Press ƒ•‚ to check a memory or line button. 1. If you are on a call or a line with dial tone, press ˙ or ®. 3. Press a memory button. 4. Dial the external number. 5. Press ˙ to store the number. 6. Label your new button. 4. Dial the extension number. 5. Label your new button. 4. Pressƒ and the feature code. 3. Press the memory button you want to erase. 4. Press ˙ to erase the button. number 7 and the Z appears on button number 9.
pull the plug from the socket. that is marked with the headset icon. jack that is marked with the jack icon. to its highest position, use these slots. the line cord back into its wall socket.